Portland second baseman Sean Coyle has been added to the US roster for the Futures Game, per Sea Dogs Assistant GM Chris Cameron. 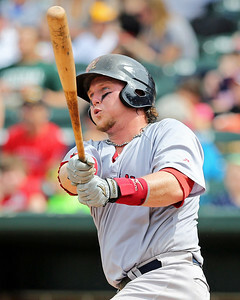 He will take the place of Mookie Betts, who is no longer eligible after his promotion to Boston on Saturday. The Futures Game will take place at Minnesota's Target Field on Sunday, July 14 as part of All-Star festivities. 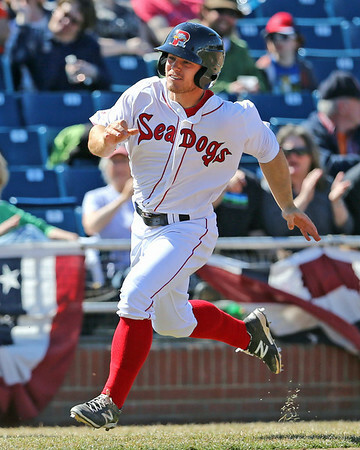 Coyle, who earlier in the day was named the Eastern League Player of the Week, is having an excellent season for the Sea Dogs. He leads the circuit in both batting average (.363) and OPS (1.059) as part of an attack that has Portland running away with a 54-27 record. 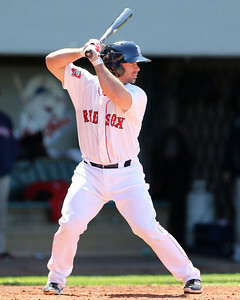 Coyle has spent most of his time at second base, but has also seen significant playing time at third base and designated hitter as he split time with then-teammate Betts for the first two months. 6/30 Cup of Coffee: It was a powerful day on the farm, as eight home runs were hit over the five games, with Matt Spring (pictured) hitting two for the Sea Dogs. Chris Hernandez and Pat Light each had strong starts, and Sean Coyle continued to pummel the Eastern League. 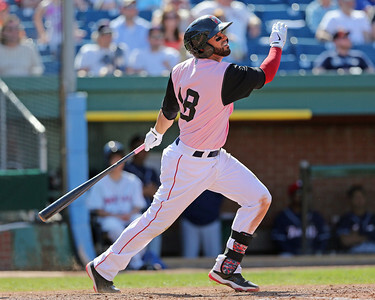 The PawSox used the long ball to down the Durham Bulls (TB), winning 7-4. Chris Hernandez was fantastic, allowing two runs in seven innings, walking one and striking out eight. Drake Britton allowed two runs in the ninth, but it was not enough to get the Bulls back in the game. 6/29 Cup of Coffee: The affiliates went home with a winning record on Saturday. Pawtucket escaped an early deficit, while Portland pushed one across in the ninth. 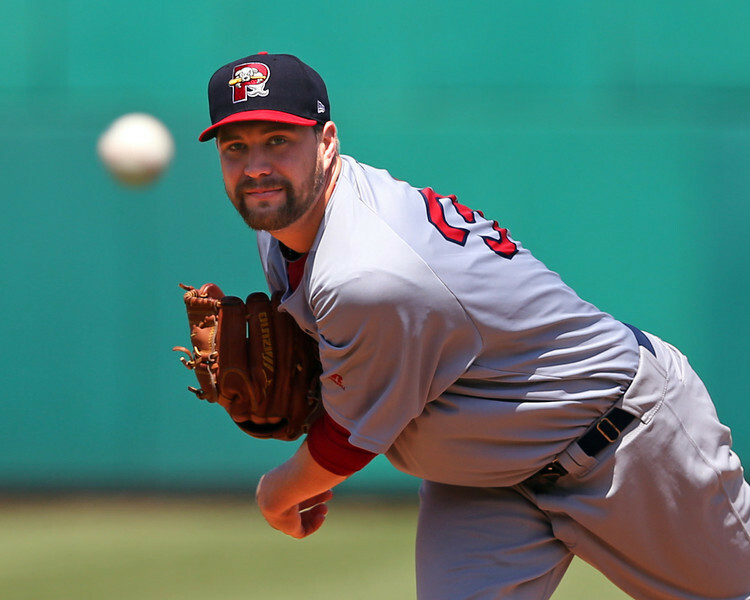 Salem and Lowell each needed only four runs to take home victories. Greenville lost a heart breaker, surrendering runs in the final two innings while the GCL Red Sox also gave up a late lead. Pawtucket worked their way around allowing four runs in the first to down the Durham Bulls (TB), 6-4. Steven Wright got the win, despite those four runs early in the game. The four runs on six hits across seven innings would be most of what Durham would manage as Alex Wilson and Rich Hill held the Bulls to two hits in the final two frames. The offense was firing on all cylinders as the PawSox racked up 12 hits between seven of their starters. 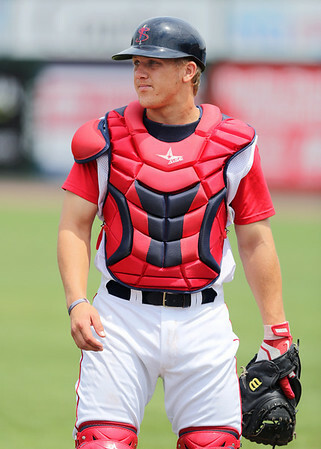 Christian Vazquez led the charge, going 3 for 4 with a home run and a double in the contest. Alex Hassan also had three hits and Carlos Rivero added two of his own. Mike Carp went 1 for 3 with a run scored. 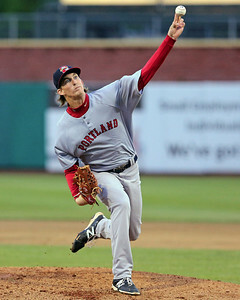 The second game of the doubleheader on June 20 was my second look at Henry Owens this season and the left-hander did not disappoint, tossing a seven-inning complete game. The first time I saw Owens back in April, he got roughed up giving up six hits in four innings, including a pair of home runs as well as three walks. He really struggled with his command that day, but also wasn’t helped by a strong wind blowing out to center field. In this more recent look, Owens worked seven innings, allowing five hits on primarily weak contact and two walks, while striking out eight, all swinging. He threw first-pitch strikes to 16 out of the 21 batters he faced and elicited 16 swinging strikes in total. He also got eight ground outs compared to only one fly out. This time around, Owens was in control throughout the start, showing off his potent fastball-changeup combination. Owens is every bit of his listed height and has a strong starting pitcher's frame. 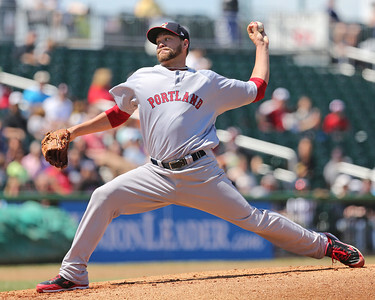 He has extremely long limbs, which for some pitchers could cause their delivery to get out of sorts easily, but Owens does a good job mitigating this with his free and easy, controlled delivery. He is very loose on the mound, expending little energy in his delivery from pitch to pitch. When Owens finishes his delivery, his length allows him to get good leverage on the ball. He throws from a three-quarters arm slot, but in this most recent outing he varied his arm angle at times. Owens also gets great deception from his delivery as the ball comes out from right behind his head. That deception in conjunction with his long limbs that allow him to get extension towards the plate mean hitters tend not to be able to pick the ball up until very late. This is important for Owens as it allows him to get away with spotty command at times and only average-to-slightly-better velocity. During the season we will be featuring videos here from the SoxProspects YouTube page. Today's video is of Luis Diaz in a spring training start. In it, you can see the recently-promoted right-hander, who has been lights out in his first two starts in Double-A Portland, facing young Tampa Bay hitters. Follow the link to the YouTube page to view many other prospect videos. 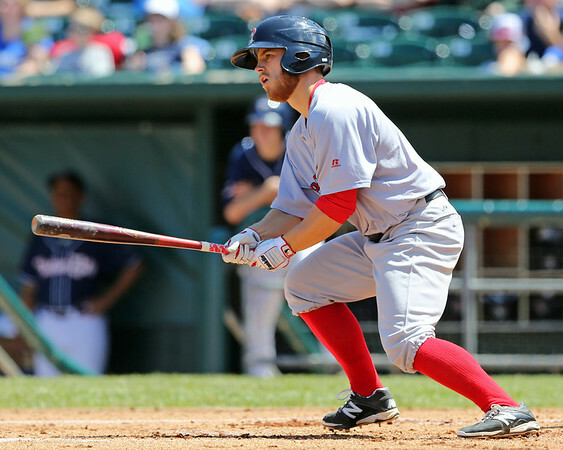 In this edition of The Write-Up, Chaz Fiorino provides detailed scouting notes from McCoy Stadium based on a doubleheader scouted on June 14. In this outing, Ranaudo's fastball ranged 89-93, and sat 89-91, which is a tick below where I’ve seen him in the past. In turn, Ranaudo did a much better job repeating his delivery and staying on line to the plate than previous starts. He’s made a very slight mechanical adjustment to minimize movement in his delivery and to get out on his front side a bit easier. This allows him to better command the strike zone. His best secondary pitch was the curveball, as is usually the case. The curveball came in at 75-78 mph with true 12-to-6 action. His changeup was in the 81-84 mph range and it presently grades a tick below-average. There have been recent reports of Ranaudo beginning to develop a slider as a fourth offering, and in this outing, I saw two sliders at 82 mph. They were flat and missed up and out of the zone arm side, grading below-average – a 40 on the 20-80 scale. With his ability to spin a well above-average curveball, I would be surprised if he isn’t able to develop a close to major league average slider with repetition in the future. 6/24 Cup of Coffee: A full slate of games on Monday was highlighted by an offensive explosion by Greenville and some excellent pitching performances. The Drive pounded out 20 hits in support of Daniel McGrath, while Steven Wright and Luis Diaz led Pawtucket and Portland, respectively. Every starter had a hit in the DSL Red Sox extra-inning win. A GCL Red Sox rally fell short in the ninth, as Lowell and Salem also came out on the losing end. Pawtucket used a five-run fifth to outlast the Scranton/Wilkes-Barre RailRiders (NYY), 5-4. The PawSox sent 10 men to the plate in that decisive inning, with Ryan Roberts delivering a two-out double to score Mookie Betts and Mike McCoy. 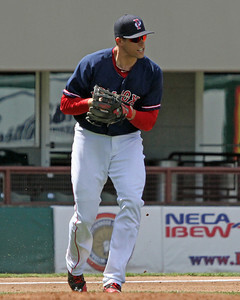 Betts was 2 for 4 with a walk and stolen base, and has reached base in all 20 games since joining Pawtucket. Steven Wright got the win in another strong start, allowing two runs on five hits in seven innings. Wright struck out seven without issuing a walk, and lowered his WHIP to 0.967. Drake Britton allowed two runs (one earned) in the eighth to allow the RailRiders within one, but Tommy Layne slammed the door with a hitless ninth. 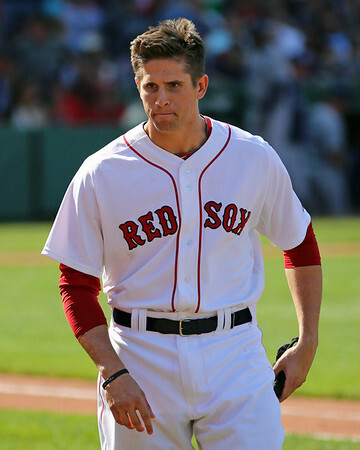 6/23 Cup of Coffee: While it was a rough day for individual performances, the big news out of Pawtucket was Garin Cecchini making the transition to left field. With Cecchini and Mookie Betts now playing in the outfield, and Andres Torres being signed, the Red Sox have shown they are looking both internally and externally to fix their outfield situation. Deven Marrero continued to crush Eastern League pitching, and Cody Kukuk took another step back for Salem. The PawSox let an early lead slip away, falling to the Scranton/Wilkes-Barre RailRiders (NYY), 5-4. Allen Webster, who has been excellent over the last month, struggled on Sunday, allowing four runs in 5 1/3 innings, walking two and striking out five. He threw 101 pitches, but only 53 for strikes, and he was also let down by his defense, as two of the runs that scored were unearned. The RailRiders got to Chris Resop for a run in the eighth, which proved to be the game-winner. Jim Callis of MLB.com reported today that the Red Sox have signed third-round pick Jake Cosart out of Seminole State College of Florida. Cosart will receive a $450,000 signing bonus, which is below the slot value of $509,400 for the 103rd pick. 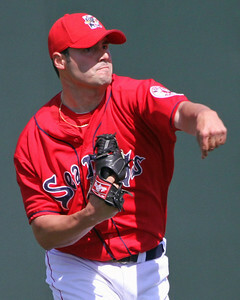 Cosart, who is the younger brother of Houston Astros pitcher Jarred Cosart, has debuted at number 26 in the SoxProspects.com rankings. 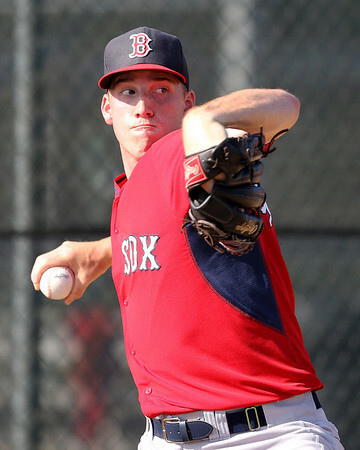 Cosart is still new to pitching, so the 20-year-old will likely be assigned to the Gulf Coast League. He can run his fastball up to 98 and has a promising curveball, but he needs to work on his command and control. He struck out over a batter per inning this season, but still posted a 5.34 ERA in 64 innings. 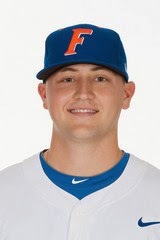 The Red Sox have agreed to terms with four picks from the 2014 draft: outfielder Danny Mars, selected in the sixth round, 11th-round RHP Karsten Whitson (pictured), 12th-round LHP Jalen Beeks, and 17th-round shortstop Jeremy Rivera. The first three were assigned today to the Short Season-A Lowell roster, and per Assistant General Manager Jon Boswell, Rivera will also be assigned to the Spinners. Mars will receive a slot bonus of $211,800 according to Chris Cotillo of MLB Daily Dish. That number has not yet been confirmed, but is the suggested bonus set by MLB for the pick. Mars projects to play center field, where he starred at Chipola College (FL). The 20-year-old had 25 stolen bases and eight triples in his single season at Chipola. 6/21 Cup of Coffee: With the Gulf Coast League schedule kicking off, Friday marked the first day that all seven affiliates were in action. The GCL Red Sox kicked off their schedule with a victory, highlighting a successful Friday. Powered by four doubles from Tim Roberson, Greenville scored 21 runs in support of Teddy Stankiewicz (pictured, left) who took a no-hitter into the sixth inning. Lowell walked off with the victory, while Pawtucket also won in its last at bat. 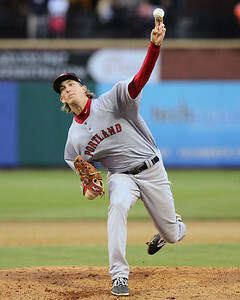 Portland hung on for a win in the completion of a suspended game, and Henry Owens fired a shutout in the nightcap. Only Salem and the DSL Red Sox lost on Friday. Pawtucket scored two runs in the ninth to steal a 3-2 victory from the Scranton/Wilkes-Barre RailRiders (NYY). Down 2-1 against former Padres and Marlins closer Heath Bell (NYY), Ryan Roberts and Alex Hassan both singled, followed by a Justin Henry walk. 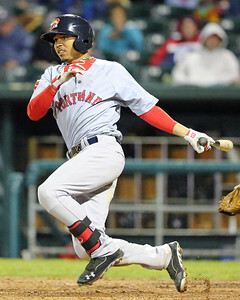 With two outs, Mookie Betts ripped a two-run single to center to put the PawSox in control. It was the third hit of the night for Betts, who doubled in the third and has reached base in 17 straight games since his promotion to Pawtucket. The rally bailed out Anthony Ranaudo, who was on the hook for the loss despite a strong performance. Ranaudo allowed two runs on four hits in seven innings, striking out six and walking two. It was the tenth consecutive start in which Ranaudo allowed three or fewer runs in at least five innings. Drake Britton was credited with the win for 1 2/3 scoreless innings, though he walked two and allowed two hits. With the bases loaded in the bottom of the ninth, Tommy Layne came on to strike out the game's final batter. The Red Sox will reportedly promote third baseman Rafael Devers to the GCL Red Sox this weekend, according to Ben Badler of Baseball America. 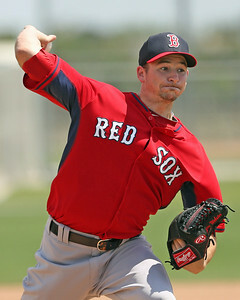 However, SoxProspects sources have indicated that the move is not official at this time and is not yet a certainty. 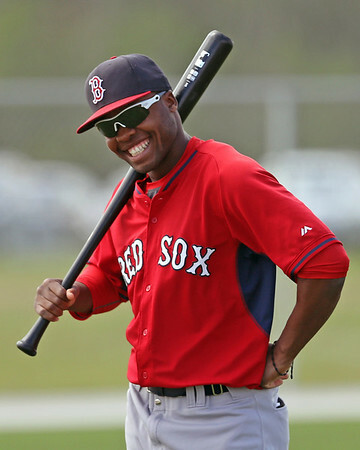 The 17-year-old Devers got off to a fast professional debut in the Dominican Summer League, hitting a spectacular .442/.537/.814 in his first 11 games, and finishing with a .379/.476/.636 line. He had reached base in every game but one, and drove in 20 runs. Devers leads the circuit in runs batted in and was tied for second in hits (25). 6/20 Cup of Coffee: It was a tough Thursday down on the farm, as Lowell was the only affiliate able to emerge victorious. Clay Buchholz was excellent in a rehab start, but Pawtucket failed to hold a six-run lead. The DSL Red Sox were also on the wrong side of a comeback. Greenville never led in its loss, while Salem was blown out. After opening a 6-0 lead, the Pawtucket bullpen imploded in an 8-6 loss to the Rochester Red Wings (MIN). Making his final rehab start before joining the major club, Clay Buchholz fired six shutout innings. He allowed only two hits while striking out five and walking a pair. After Buchholz came out, the wheels came off. Rochester scored three in the seventh off of Dalier Hinojosa, who retired only two batters. Alex Wilson came on and notched a strikeout to end that rally, but Wilson was lit up for five runs in the eighth, highlighted by a grand slam. The loss came despite a 12-hit attack from the offense. Travis Shaw was 2 for 5 with a seventh-inning homer that gave the PawSox its six-run lead that would soon be erased. That ended a 2-for-17 skid for the first baseman. Ryan Roberts and Alex Hassan reached three times apiece, both going 2 for 4 with a walk. Roberts scored a pair of runs, while Hassan had a double and drove in two. 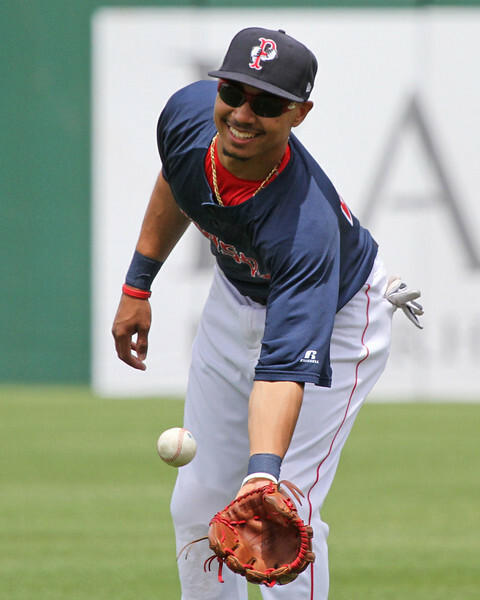 Mookie Betts had a second inning single and has reached base safely in all 16 games since his promotion. Three Greenville Drive players were promoted to High-A Salem Thursday. Right-hander Joe Gunkel (pictured), third baseman Jantzen Witte, and catcher Jordan Weems have been called up to join the Salem Red Sox roster. Alex Speier of WEEI.com first reported the Gunkel and Witte promotions on Twitter. 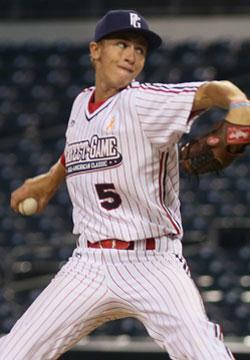 SoxProspects.com's Matt Huegel confirmed Speier's report and added Weems was also promoted. 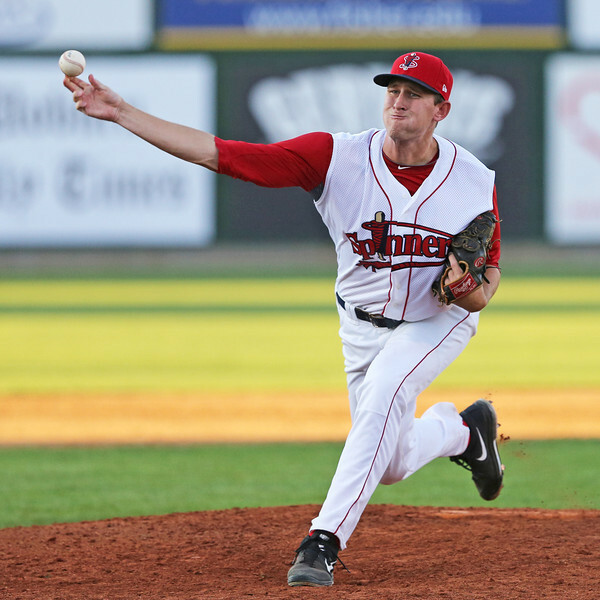 Gunkel, 22, has appeared in 17 games for Greenville in 2014 and has started his last five. In five starts, Gunkel has posted a 2.96 ERA over 27 1/3 innings while striking out 29. He's also posted a remarkable 0.65 WHIP as a starter. 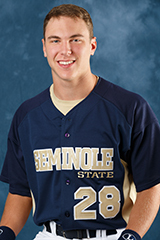 Overall in 2014, Gunkel has posted a 2.28 ERA and a .149 batting average against. 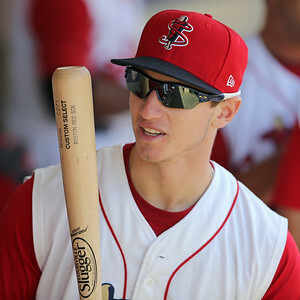 Gunkel was a 13th round selection in the 2013 draft. 6/18 Cup of Coffee: The South Atlantic League and Carolina League All-Star games saw multiple Red Sox prospects in action, while mother nature threw a wrench in both Pawtucket and Portland's games. Lowell and the DSL Red Sox both found the winners circle thanks to superb pitching. Pawtucket's contest against the Rochester Red Wings (MIN) was suspended due to rain in the fourth inning with the PawSox leading 2-1. The game will be completed tomorrow and immediately followed by game two, which will be shortened to seven innings. Steven Wright received the start for Pawtucket, tossing three innings, allowing one run on four hits and a walk. 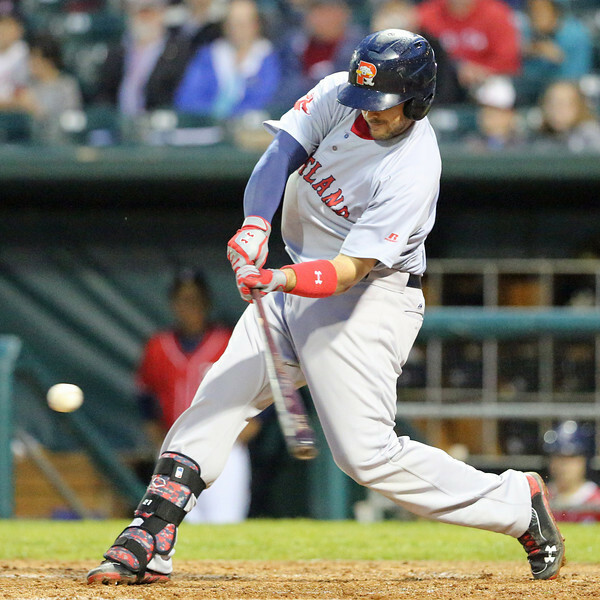 Carlos Rivero's two-run home run in the third inning gave the PawSox a 2-1 lead. The rehabbing Shane Victorino and Will Middlebrooks were each 0 for 2 before the rain. According to Mike Antonellis on Twitter, RHP Luis Diaz has been promoted to Double-A Portland and will start tomorrow's game against the Erie SeaWolves (DET). The 22-year-old Diaz has had a solid season for High-A Salem, going 6-3 with a 3.33 ERA in 13 starts. Currently ranked the 23rd best prospect in the Red Sox system by SoxProspects, Diaz has performed admirably this season in night games, going 6-1 with a 1.62 ERA in nine starts. The Diaz promotion follows the suspension of Miguel Pena, who had been a part of the Sea Dogs starting rotation this season going 2-2 with a 6.41 ERA in 13 starts. The Red Sox have designated outfielder Grady Sizemore for assignment and recalled third baseman Garin Cecchini (pictured) from Triple-A Pawtucket. Cecchini's recall was first reported by Chris Cotillo of MLBDailyDish. It was confirmed by Alex Speier of WEEI.com, who also reported the news on Sizemore. Cecchini made his major league debut on June 1, going 1 for 2 with a double in a victory over Tampa Bay. He has struggled with Pawtucket since then, going just 7 for 37 with two extra base hits, but gives the Red Sox a left-handed bat off the bench for their series against Minnesota. Overall, Cecchini is hitting .263/.344/.329. The Red Sox and first-round selection Michael Chavis agreed to terms on a deal worth $1,870,500, according to multiple reports citing industry sources. 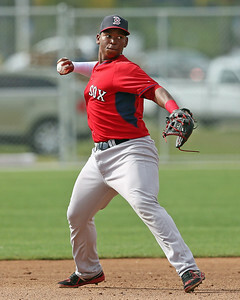 The deal was first reported by Ryan Hannable of InsidetheBattersBox.net and was confirmed by Alex Speier of WEEI.com. According to both the deal is pending a physical. Chavis, 18, out of Sprayberry High School in Ga., is reported to have signed right at slot level. Chavis is a shortstop by trade, although there are murmurings he may move off the position, and was selected by the Red Sox with the 26th overall selection. Chavis hit .580 with 13 home runs, 9 doubles, and 10 steals in 28 high school games. According to Jim Callis on Twitter, the Red Sox have signed first round pick RHP Michael Kopech (pictured, right) second round selection 1B Sam Travis, fifth rounder 1B Josh Ockimey, fifteenth round selection CF Trenton Kemp and nineteenth round pick CF Tyler Hill. WEEI.com's Alex Speier reported earlier this week that the Red Sox signed thirteenth round pick RHP Chandler Shepherd and eighteenth round selection 3B Jordan Betts. 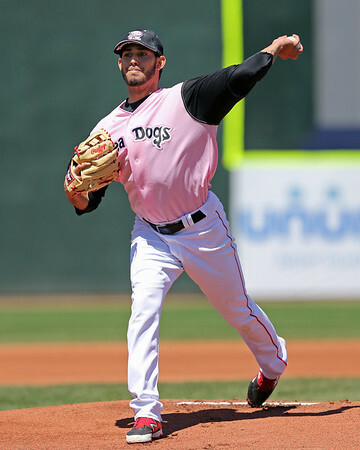 The Office of the Commissioner of Baseball has announced that left-handed pitcher Miguel Pena of the Double-A Portland Sea Dogs has been suspended 100 games for testing positive for a drug of abuse. It is Pena's third positive test since being drafted in 2011, and his second in two years. Pena, 23, was drafted in the sixth round of the 2011 draft out of San Jacinto (TX) College. Along with his tremendous physical attributes were known off-field issues, including Pena being sent home from the Cape Cod League in 2010. 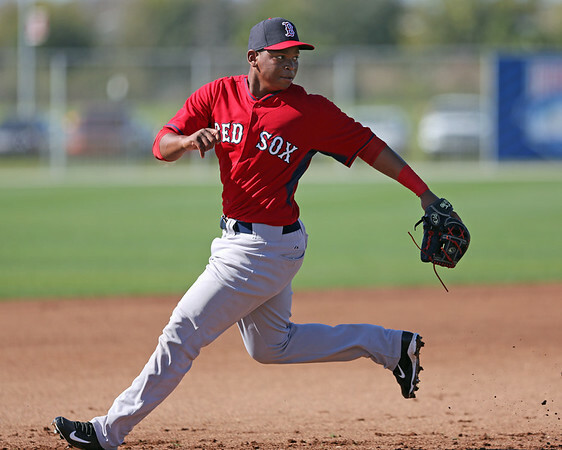 Placed in Salem out of Spring Training in 2013, Pena was suspended on April 17 for a second failed test. 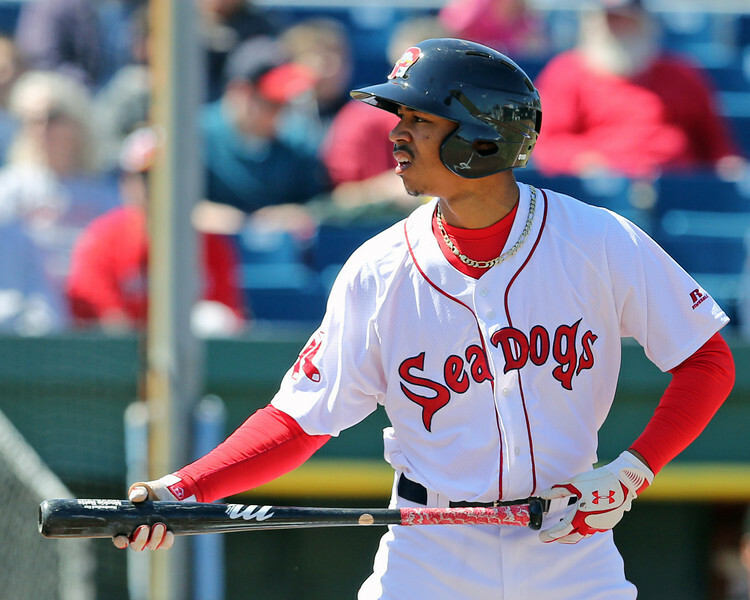 SoxProspects Managing Editor Matt Huegel talked to Mookie Betts, who discussed a new level of competition at Pawtucket as well as trying the outfield for the first time. The Red Sox signed veteran outfielder Andres Torres to a minor league deal this week. Torres will likely be in the outfield mix at Pawtucket, serving as depth for the major league squad. 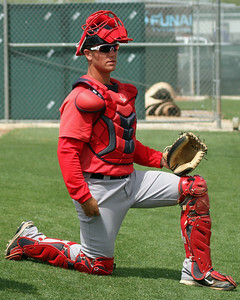 The Providence Journal's Tim Britton talked to multiple members of the Red Sox organization about the development of Christian Vazquez, (pictured) whose game is developing far beyond his prowess for throwing out base runners. 6/14 Cup of Coffee: Offense was at a premium on Saturday as the affiliates managed to score just 22 runs over seven contests. Pawtucket split a doubleheader, while Portland and Greenville rode masterful pitching to victory. Salem squandered a strong start and the Spinners couldn't climb out of an early hole, while the DSL Red Sox' comeback bid fell short. 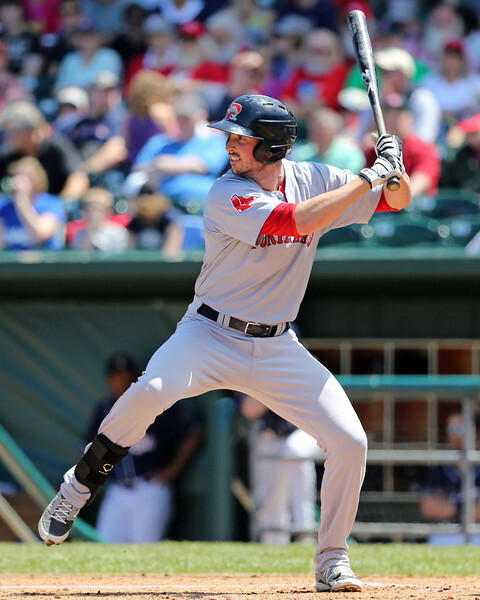 The PawSox dropped game one of a doubleheader to the Charlotte Knights (CHW), 3-0. A rehabbing Clay Buchholz got the start for Pawtucket and allowed three runs across 4 2/3 innings of work. 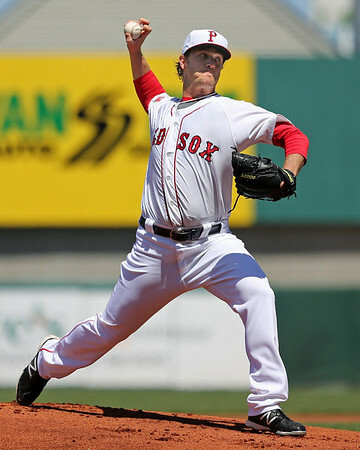 Buchholz allowed four hits, two of which were solo home runs, and struck out five. Buchholz, who took the loss, threw 42 of his 62 pitches for strikes. Rich Hill and John Ely combined for the final, scoreless, 2 1/3 innings of the seven-inning contest. Pawtucket's bats were held in check as they managed only four hits in the game. 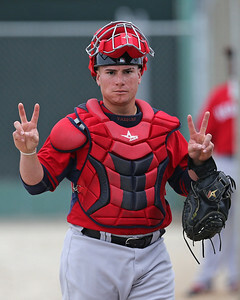 Christian Vazquez went 2 for 2 with a walk. The rehabbing Will Middlebrooks picked up one hit in three at-bats while serving as the team's designated hitter, while Shane Victorino went 0 for 2 and played five innings in right field. 6/14 Cup of Coffee: The DSL Red Sox launched an offensive assault while the Greenville Drive swept both sides of a doubleheader. The Sea Dogs fell, Salem won behind strong pitching, and the Spinners scored seven in victory. The Pawtucket Red Sox game against the Charlotte Knights (CHW) was postponed due to rain. The contest is being made up Saturday, June 14. 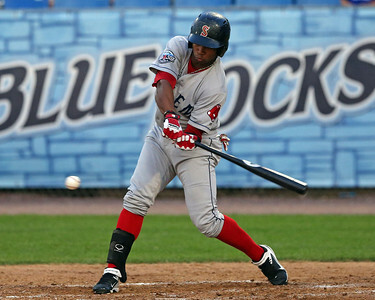 The Portland Sea Dogs fell to the Akron Rubberducks (CLE) by a score of 6-1 on Friday. 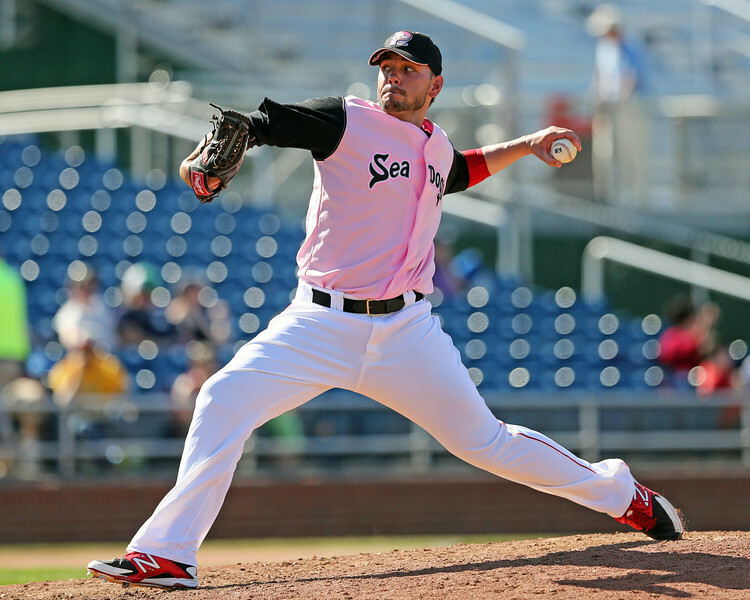 Sea Dogs starter Michael Pena lasted six 1/3 innings and yielded 11 hits, two walks and six earned runs. The Sea Dogs offense did not fair much better and was only able to muster seven hits. Two of those hits came off the bat of second baseman Sean Coyle. 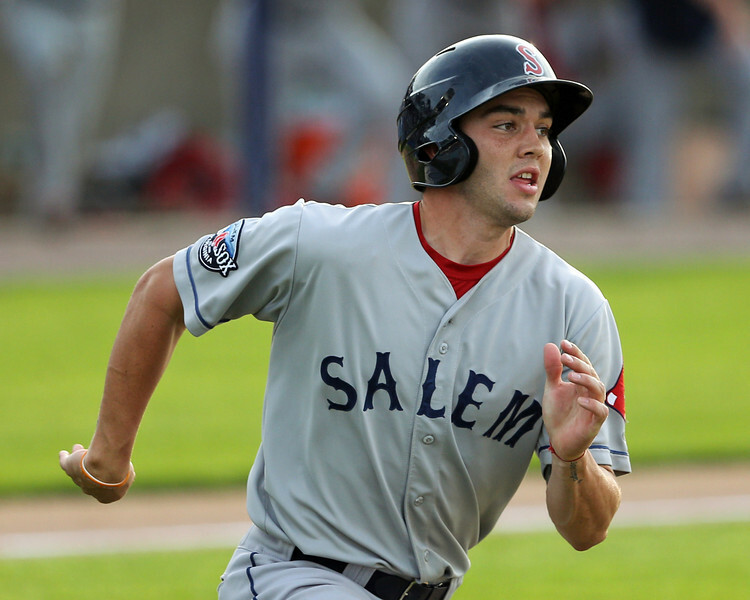 The lone Sea Dogs run was scored by Derrick Gibson and was driven in by catcher Blake Swihart (Pictured), who was 1 for 3. Question: Who is the only left-hander in the Portland Sea Dogs bullpen? Answer: Robby Scott. 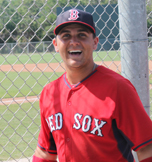 The 24-year-old undrafted free agent out of Florida State has made a quick progression to Double-A since spending the entire 2012 season with the Gulf Coast League Red Sox. After jumping directly from the GCL to High-A Salem to begin the 2013 season, Scott put together a solid campaign to put himself on the map. This year he moved up to Double-A Portland, and has gotten off to a blistering start. Already in early June, Scott has a 6-1 record and one save with a 0.61 earned run average in 29 1/3 innings of work. 6/12 Cup of Coffee: Greenville and the DSL Red Sox both took home victories as Salem and Portland, the only other two affiliates in action, were suspended/postponed due to the weather. The Portland Sea Dogs and the Altoona Curve (PIT) saw their contest suspended due to rain after two and a half innings. The two teams intend to make up the lost innings on June 12. When the game was suspended, the Sea Dogs had a 2-1 lead over the Curve thanks to a two-run home run from Stefan Welch (pictured, left). Welch launched the home run, his fourth of the season, in his first at-bat of the game, and is currently 1 for 1 with two RBI. The Sea Dogs starter was Keith Couch, who yielded one run on three hits and struck out three in just two innings pitched. The Red Sox have signed veteran outfielder Andres Torres to a minor league contract, the team announced today. Torres has appeared in 650 major league games and played a key role on the 2010 San Francisco Giants team that won the World Series. Torres, 36, is best remembered for that 2010 season, when he hit .268/.343/.479 as the Giants starting center fielder, and went on to go 7 for 22 in the World Series. He finished fourth in the National League with 43 doubles that year, and added 16 home runs and 26 stolen bases. Originally drafted back in 1998 in the fourth round by Detroit, Torres has played parts of nine major league seasons with the Tigers, Rangers, Giants and Mets. He struggled to a .250/.302/.342 line with the Giants in 2013 and was unsigned as a free agent after the season. A switch-hitter, Torres will provide depth to the Red Sox injury-depleted outfield. He has seen playing time throughout his career at all three outfield positions, with the majority of the playing time coming in center. 6/11 Cup of Coffee: The affiliates were 3-2 on Tuesday, with Pawtucket, Portland and the DSL Sox all obtaining victories. Salem and Greenville each had solid offensive showings in their losses, but were victimized by poor relief efforts. Pawtucket cashed in on a big day from Garin Cecchini (pictured, right) to take down the Louisville Bats (CIN), 4-3, in ten innings. Rehabbing left-hander Felix Doubront got the start for the PawSox, hurling 4 2/3 innings, allowing two runs on six hits and a walk, striking out three. Doubront exited the game after 75 pitches, throwing 44 of them for strikes. Four Pawtucket relievers, including Rich Hill, Jeremy Kehrt, Drake Britton, and Tommy Layne, each added a scoreless inning of relief in the winning effort. Down 2-0 in the fourth, Pawtucket got on the board thanks to a Cecchini solo home run, his second since joining the PawSox. Down 3-1 in the seventh, the PawSox would rally tie to the game on a Mookie Betts RBI single and a Carlos Rivero sacrifice fly. The game remained knotted until the bottom of the tenth, where Pawtucket faced former Chicago Cubs closer Carlos Marmol (CIN). Marmol allowed a one-out single to Cecchini and followed up the single with two wild pitches, allowing Cecchini to move to third. With the bases loaded after two walks, Dan Butler lofted a sacrifice fly to bring home the winning run. 6/9 Cup of Coffee: It was a wild day on the farm, with three games being decided on walk-off hits. Derrik Gibson was the hero for Portland, while Salem and Greenville were on the wrong end of the comebacks. 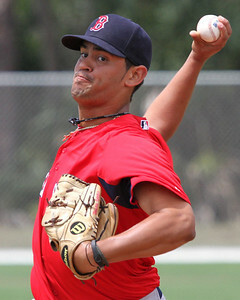 Chris Hernandez (pictured) was dominant for Pawtucket, carrying a no-hitter into the seventh. 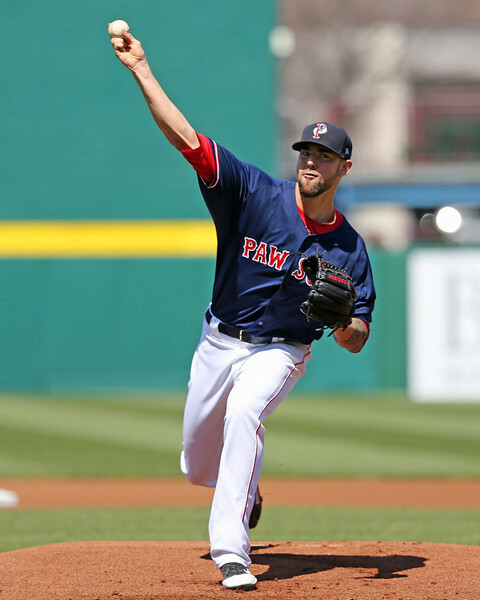 Behind a terrific performance from Chris Hernandez, the PawSox defeated the Louisville Bats (CIN), 4-3. Hernandez went the first 7 1/3 innings, allowing only one run on one hit, walking two and striking out nine. He carried a no-hitter into the seventh, when he allowed a leadoff single to Joey Votto (CIN), but that was all the damage the Bats could do. Hernandez picked up his third win of the season, and has now gone at least seven innings in two of his last three starts. 6/8 Cup of Coffee: The affiliates took home a split with Greenville splitting a doubleheader of their own. Salem scored in the ninth to take home the win and Pawtucket won behind explosive bats and strong pitching. Portland gave up a big lead and the DSL Red Sox only managed three hits. The PawSox rode a bounce-back start from Matt Barnes (pictured, right) to a 7-2 victory over the Louisville Bats (CIN). Barnes picked up his first win since April 25 with a 6 2/3-inning effort. Barnes gave up two runs on seven hits and struck out three. Barnes threw 64 of his 93 pitches for strikes. Alex Wilson pitched a shaky 1/3 of an inning in which he allowed a hit and a walk before getting the final out. Tommy Layne picked up the save, pitching the final two innings, allowing just one hit and striking out two. Carlos Rivero led the charge, going 3 for 4 with a triple and five RBI. Travis Shaw had two hits, a walk and scored three runs, while Christian Vazquez went 2 for 4 with two runs scored. Mookie Betts went hitless in three trips to the plate, though he did manage to draw a walk. In 2014, the Red Sox departed from past strategy, selecting only two college seniors in the first ten rounds. Typically, Boston (and other teams for that matter) will select a handful of seniors on the second day with the intention of signing them to below-slot deal and using the savings to sign other players taken in the first 10 rounds. However, 2014 saw a decrease in high-risk, signability players outside the first 10, as the Sox selected only 12 high school players in rounds 11-40, compared to 19 in 2013. All told, the Red Sox selected 19 players who were ranked in either the Baseball America Top 500 or in the Perfect Game Top 300, only a notch below the 20 ranked players they selected last year, despite having one more pick in the first 10 rounds. Furthermore, after selecting 19 players who appeared in BA's Top 500 and 11 in the PG Top 300 in 2013, the Sox took 15 players who appeared on BA's list and 14 from PG's.